What’s Next for ESG Metrics? Several groups have written predictions about the future course of the Environment, Social, and Governance (ESG) measurement space. We’ve seen stories about the importance of millennials (as both customers and employees), a sense that carbon tracking is finally an accepted part of corporate life, and that companies must watch out for a range of new legal and regulatory issues. At CSRHub, we are exposed to all of these trends, and many more. Our data collection engine automatically absorbs new data elements on 3,500 topics from 435 data sources. It analyzes this information, normalizes it, weights it, and outputs ratings on more than 15,000 companies. Each month we get a fresh look at what sustainability professionals around the world think is important. One thing we’ve watched for several years is the shift in emphasis between interest in Environmental, Social, and Governance issues (“ESG” issues). Governance and Environment each had their time as the top area of focus. 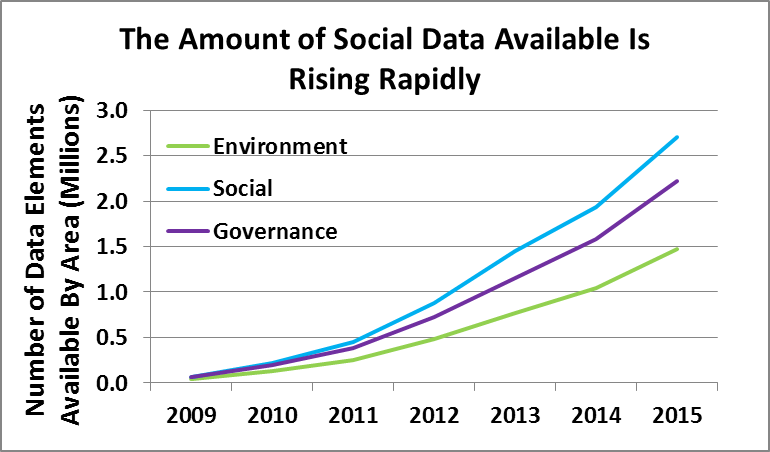 However, our data shows clearly that Social issues are now emerging as the focus for corporate social behavior analysis. 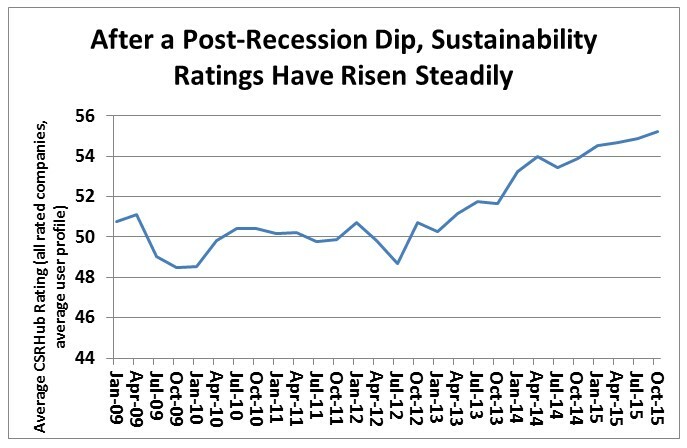 The overall sustainability ratings for the companies CSRHub tracks was stable or even dropped a little between 2009 and 2011. We believe this was due to cutbacks on ESG spending, following the great recession of 2008-9. Since 2011, we have seen steady overall improvement across companies in all industries and geographic regions. It is relatively easy to drill down into this data and pull out the average ratings across all of the companies CSRHub tracks, for each aspect of ESG. However, our coverage has grown rapidly over the past eight years, partly due to the fact that we’ve found more data sources (we started with only 70 sources) and partly due to the fact that more companies are reporting sustainability information. To ensure that we could focus just on trends in ESG focus, we selected 400 companies from this year’s Fortune 500 for whom we had full ratings back to 2009. As you can see in the graph below, the ratings on Governance issues for this set of 400 companies have fallen since 2009 (probably as the legal and governmental pressures from the recession receded). Environment had an upward spike in perceived performance from 2012 through 2014, but has now leveled off. 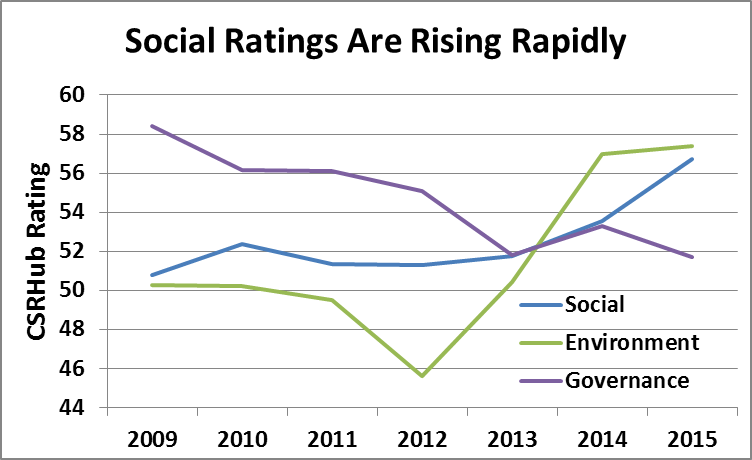 Social ratings have now started to move up and look likely to soon pass those for the other two areas of ESG. We can also track how much information we receive from our sources for each area of social performance. If we assume that the amount of information our sources receive ties to the amount of information that companies produce, we see evidence that the group of companies we study have generated more data in Social than in either of the other two areas. CSRHub tracks six different social metrics areas: Community Development & Philanthropy; Compensation & Benefits; Diversity & Labor Rights; Human Rights & Supply Chain; Product; and Training Health & Safety. We expect to see our clients continue to step up their efforts to benchmark their performance against that of their competitors in each of these areas. 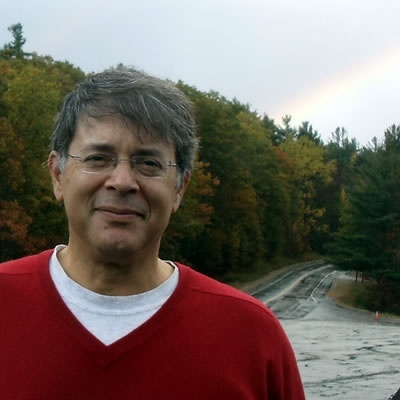 Software firms will add more tools and consultants will write more reports on Social practices—just as they did during the 2008-09 era for the Governance space and in the 2012-14 era for the Environment space. The overall effect should be a refocused interest on improving corporate performance on social issues, over the next few years.